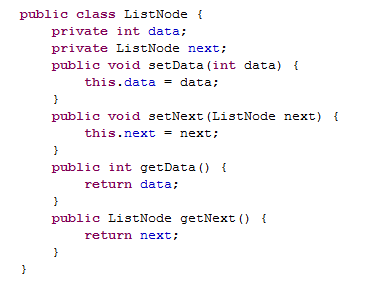 In this post, we'll see the basic of Linked List, its advantages and implementation in Java. Successive element are connected by pointers, in Java we means references. Can grow or shrink in size during the execution of a program. Can me long as long as required. Each record of a linked list is often called an element or node. 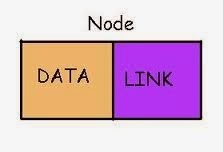 The field of each node that contains the address of the next node is usually called the next link or next pointer. The remaining fields are known as the data. The head of a list is its first node. 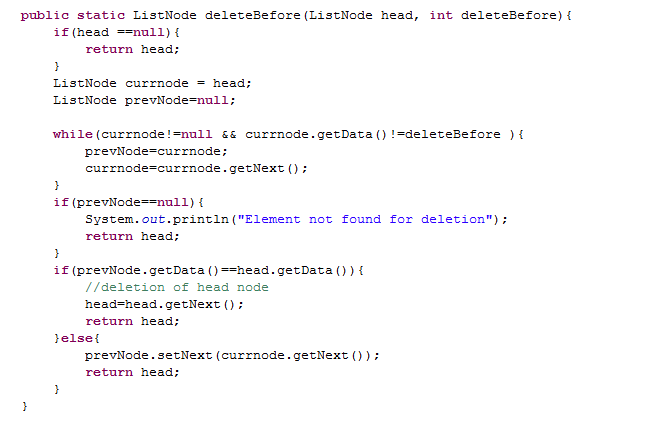 The tail of a list may refer either to the rest of the list after the head, or to the last node in the list. Singly linked lists contain nodes which have a data field as well as a next field, which points to the next node in line of nodes. There are basic 4 ways to add element in a linked list. Insert element at the beginning of the Linked List. Insert element at the end of the Linked List. Insert element after a specific element in the Linked List. Insert element before a specific element in the Linked List. Display the content of the node as they traversed and move the pointer to next node. Update the next pointer of new node to point the current head node. Update the head pointer point to the next node. Move the head pointer (temp counter) to the last node. Update the last node next pointer to the new node. 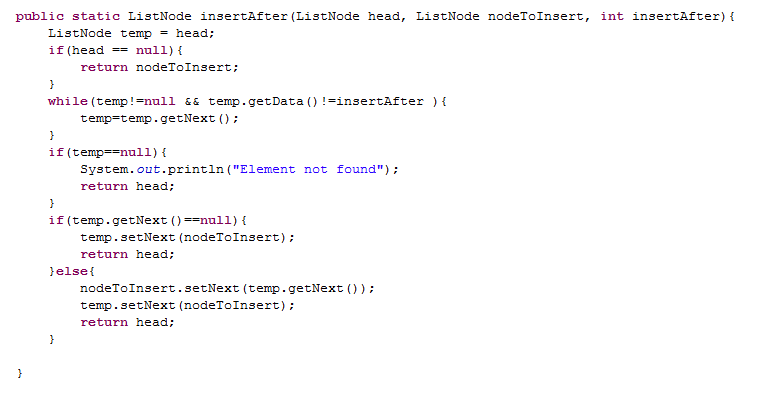 Move the head pointer and previous pointer until specific element is found, else return by saying element not found. If new node has be added before head node, update the the next pointer of new node to to head and point head to new node. Update the previous pointer to new node and new node pointer to temp. 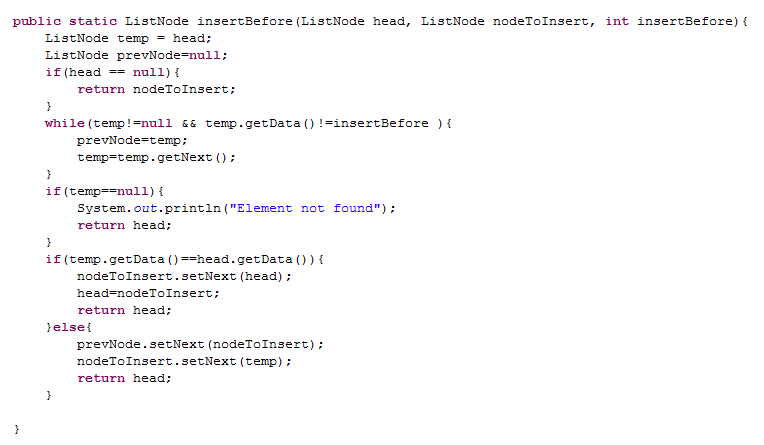 Move the head pointer until specific element is found, else return by saying element not found. If new node has be added at the end, update the the head pointer of new node to the new node. Update the new node pointer to next of current head node and head pointer to new node. There are basic 4 ways to delete element in a linked list. Delete element at the beginning of the Linked List. Delete element at the end of the Linked List. Delete element after a specific element in the Linked List. Delete element before a specific element in the Linked List. Create a temporary node that point to same node as head. Move the head pointer node to the next node and dispose the temporary node. 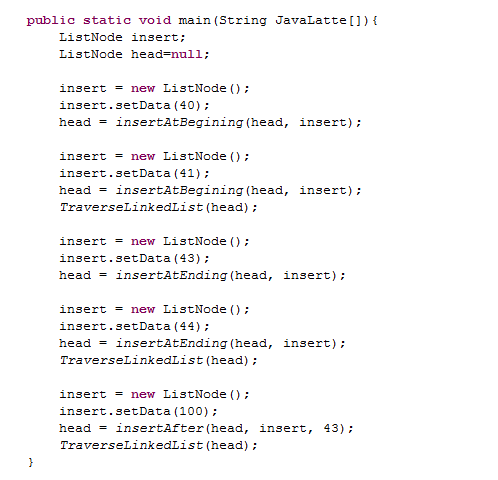 Traverse the list and while traversing the list maintain the prev node pointer. By the time we reach at the end one pointer is pointing to the tail node and other is pointing the node before tail node. Update the prev node next pointer to NULL. Dispose the tail node i.e, curr node. Move the pointer until we find the specific element else return by saying Element not found for deletion. If prev pointer point to first node, simply update the head otherwise go to next step. Set the prev node next to the curr node next pointer. This procedure is bit complicated, in this case we take two pointer one is currNode and other is nextNode means we move one step forward. If there is one no element or one element, we simply return otherwise we move until nextNode become null. If nextNode is null means we didn't find the element. 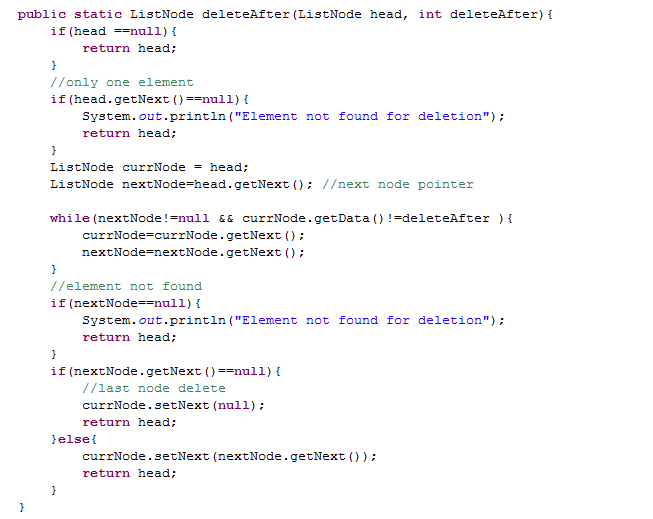 If nextNode next pointer is null means it is the last node otherwise we point currNodex next pointer to nextNode next pointer. While iterating the linked list we store current node in some temporary variable and freeing the current node. After freeing the current node go to the next node with temporary variable and repeat the process. Thanks for reading this post and I appreciate your concern. Main purpose for publishing code as image is to look good in terms of formatting and display. Secondly, I want that those who ever read the code should implement or understand it by writing itself instead of just copy and paste. On the other hand, I can try to give the download link for codes, for those who want to use it directly.